“Each regiment formed upon a squadron frontage in three lines from 300 to 500 yards apart, and every man was restless, excited, and resolute for victory. At 4.30 the two regiments moved off at a trot. Surprise and speed were their one chance, so no time was lost in breaking into a gallop. For what seemed to be a space of minutes the Turkish fire ceased, as if the garrison was wondering what the approaching horsemen had in mind. Then swiftly realising that they were out for business, the whole line burst into a flame of fire. But the Australians were not to be denied, much less were their glorious chargers in the mood to hesitate. As if entering into the spirit of the great game, with ears pricked and manes flashing back, they headed in a wild scamper into the setting sun. 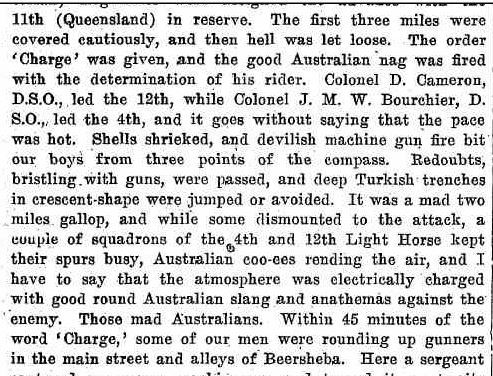 The outcome, achieved in just under 60 minutes of wild riding, sheer bravery and maybe a touch of madness, saw the 4th Light Horse Brigade, consisting of the 4th and 12th Light Horse Regiments, capture Beersheba in one of the most important offensives of WW1. 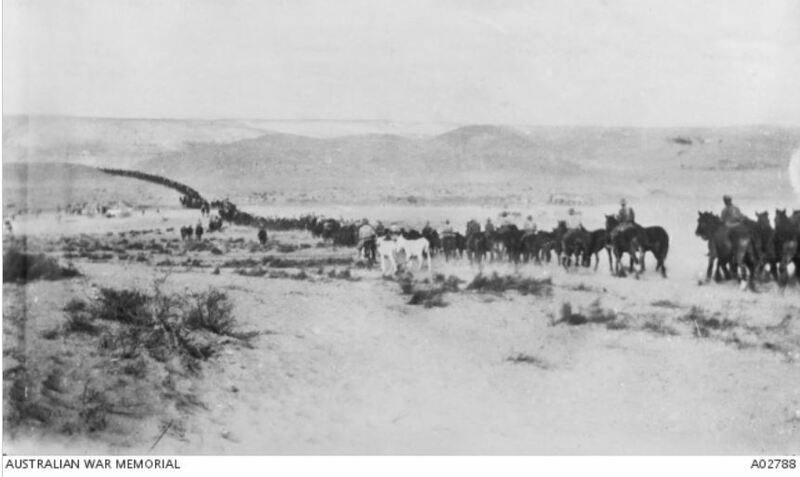 Eight hundred Australian Light Horsemen waited on a ridge about six kilometres from the town of Beersheba, hidden from the Turkish troops. At 4.30pm on October 31, 1917, under the orders of Lieutenant General Harry Chauvel, they moved forward, first at a walk, then a trot, gradually quickening until the order of “CHARGE” was given, and 800 horsemen urged their horses, tired and thirsty from travelling overnight, into a gallop. 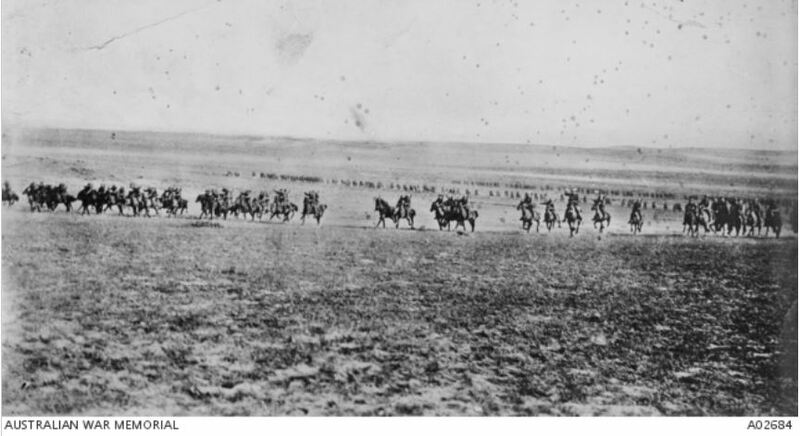 The Turks, expecting the Australians to dismount and fight one on one at the first trench, watched with surprise as horsemen, with only bayonets in hand, rode resolutely with no intention of stopping. They cleared the first trench, then the second. 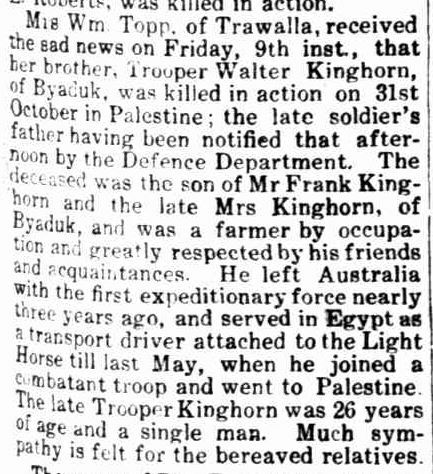 As the first squadron approached the third trench and dismounted, gunfire raining upon them, a bullet hit a 28-year-old farmer from Byaduk in the Western District and he died where he fell. Walter Rodney Kinghorn, the youngest child in a family of 12, was born in Byaduk in 1888 to Francis Kinghorn and Elizabeth White. 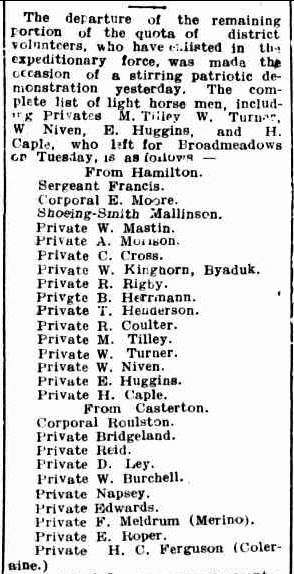 Britain declared war on Germany on 4 August 1914 and 20 days later at Broadmeadows, 26-year-old Walter Kinghorn enlisted, one of the first from the Hamilton district to do so. Prior to that, life for unmarried Walter consisted of farm work at Byaduk, like his father and brothers before him. His future had looked mapped out for him, but with no wife or children, the offer to see the world was all too enticing. 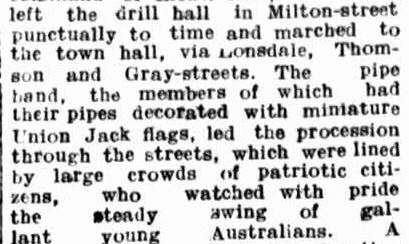 On August 22 1914, the people of Hamilton demonstrated the patriotic feelings that abounded as they bid farewell to what they then thought was the remaining quota of Hamilton district volunteers preparing for departure overseas. Those in the streets that day described the scene as “stirring”. It was not just men leaving Hamilton. 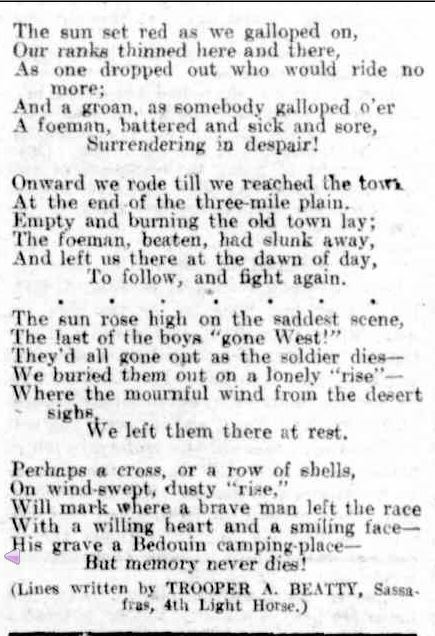 Fourteen horses, donated by prominent local breeders, including James Learmonth of Melville Forest, also said goodbye to their breeding grounds and like the men, were oblivious to what lay ahead of them. The mood was buoyant and locals provided gifts for the men including cigarettes and a box of cigars, from Mr Short, brother-in-law of Private Maurice Tilley. The parade moved along the streets of Hamilton to the Town Hall, accompanied by the Hamilton Pipe Band. 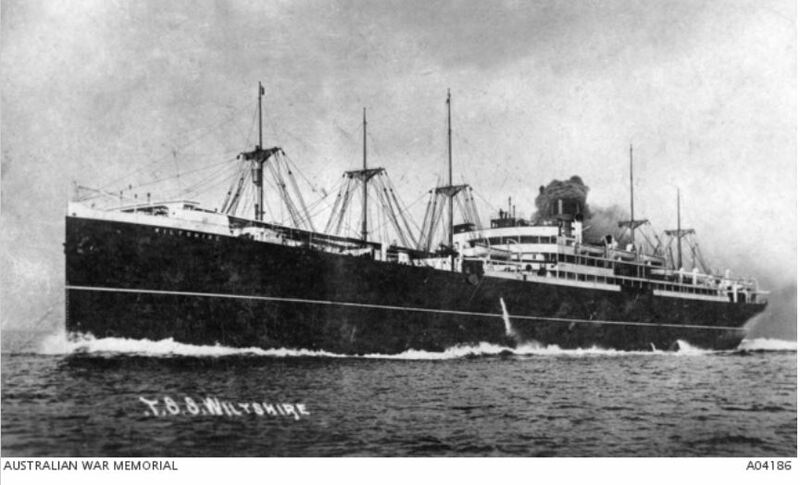 Walter spent time training at the Broadmeadows Camp until 19 October 1914 when the men and horses of the 4th Light Horse sailed aboard the steamer HMAT Wiltshire bound for Egypt. With him were Tom Henderson, Maurice Tilley and William Niven of Hamilton and John Francis of Yulecart. 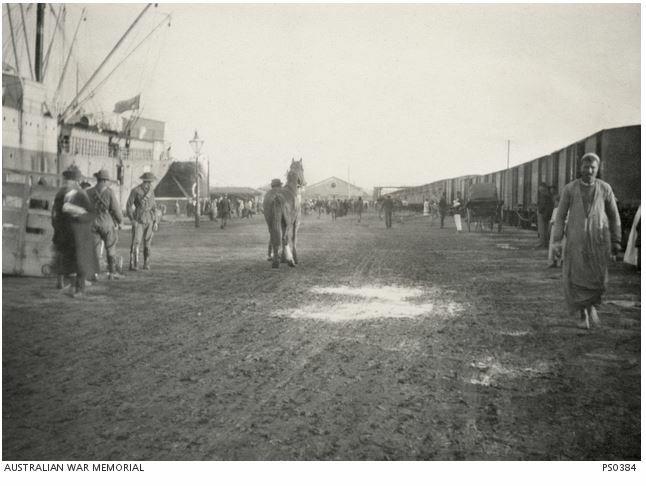 They arrived at Port Said, Egypt on 10 December 1914 and work began to unload the horses and set up camp. Walter Kinghorn’s service record gives no clue to his whereabouts from the time the steamer docked in December 1914 until 2 January 1916 when he was recorded as being in Heliopolis. The only other listing was that he was a driver with 4th Light Horse Transport from the time of his enlistment until July 5, 1916. 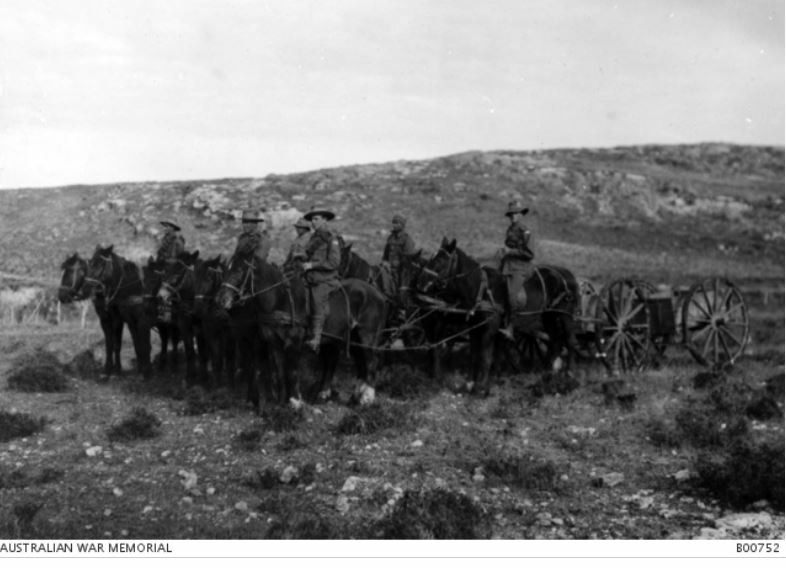 If Walter remained with the 4th Light Horse after their arrival, he would have travelled with them to Gallipoli during May 1915, minus the horses, as infantry reinforcements. The regiment spent six months in the trenches at ANZAC Cove before returning to Egypt to discover the regiment would be split up. Horses had limitations in the desert with water supplies an ongoing concern. Two squadrons left for France, while the rest remained around the Suez Canal. Walter spent time at the 4th Light Horse Regiment Headquarters at Heliopolis before falling ill late in May 1916. He spent a few weeks in hospital before joining the 1st Light Horse for a month at Tel-El-Kebir. Then on to the 1st Double Squadron at Serapeum, Egypt in July, where he remained for four months. 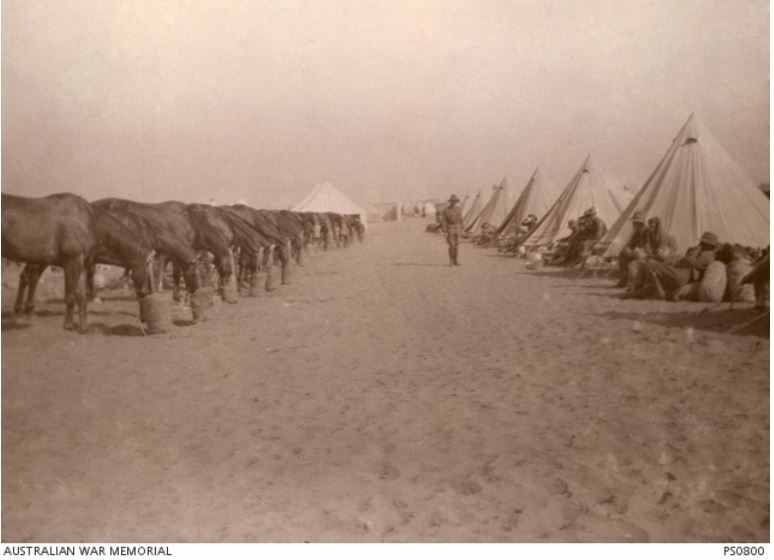 There was still reshuffling among the Light Horse regiments and the 4th Light Horse joined with the Imperial Camel Corps to form the 3rd Camel Regiment at El Ferdan, Egypt in November 1916. 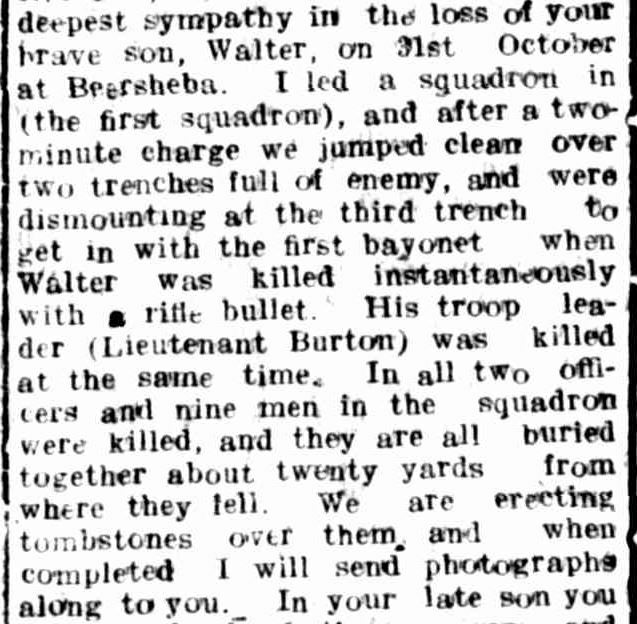 Walter was with the camel regiment for three months. On December 27, 1916, Henry Langtip wrote in his diary “Got camels issued today. I don’t like them at all but I suppose one will get used to them“, but the following day…”On camels for the first time today and it was great fun as several fell off”. 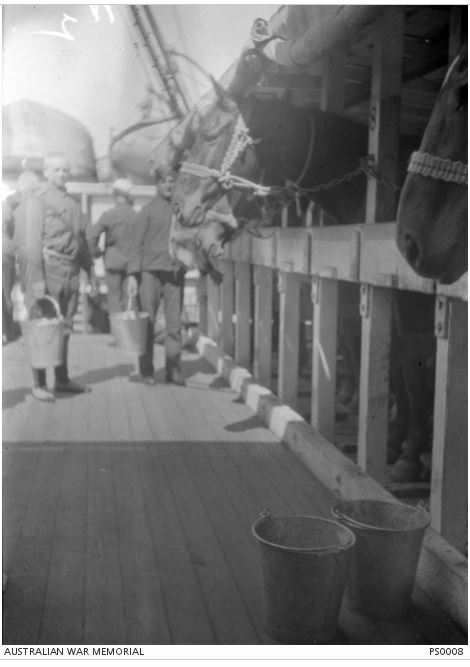 With further reorganization to the mounted brigades in early March 1917, Walter returned to his role as a driver with the 4th Light Horse Transport, then camped at Ferry Post on the Suez Canal. He was also promoted to Lance Corporal. For some reason, at his own request, Walter reverted from driver to trooper on May 26, 1917 while in Tel El Fara, Palestine. That decision may have sealed his fate. 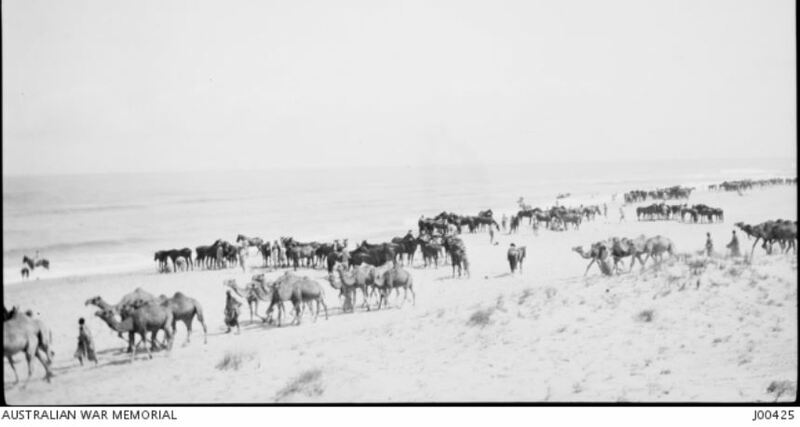 In the months leading up to the attack on Beersheba, on two occasions the Allies had unsuccessfully tried to take Gaza but a different tack was in the planning. The Light Horse would come from another direction, the East. Harry Langtip wrote on Sunday 28 October1917, “We are ready to move out to attack Beersheba at a moments notice. We have had a lecture from the Colonel and he tells us that we are going 30 miles tonight and 30 miles again the next night” (p37 of transcript). Soon they were on the move as the charge began. 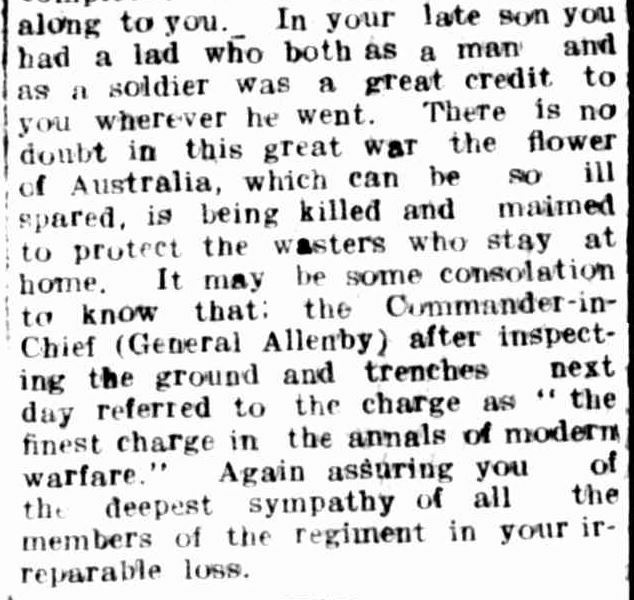 Aloysius Cotter of the 4th Light Horse wrote home to his sister in Gippsland about the charge. He recounted burying his head in his horse’s mane as they galloped directly into the barrage. 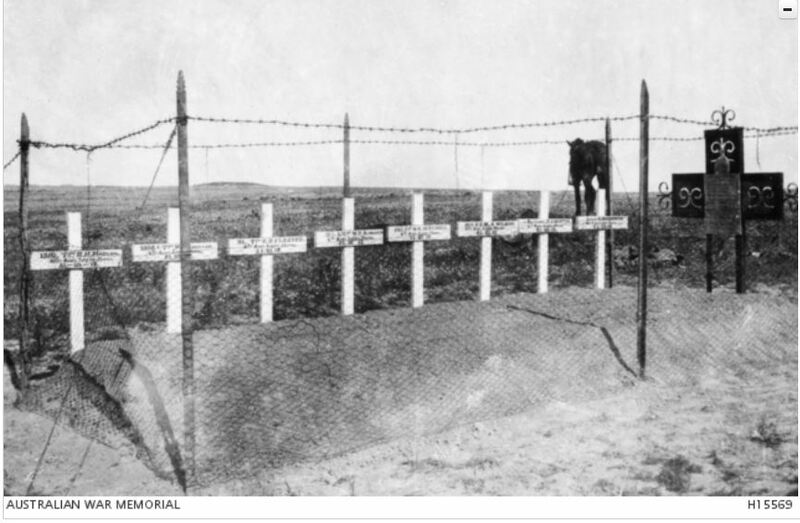 Thomas Hoskisson, of the 12th Light Horse Regiment, wrote home to his brother in N.S.W. about his experience. Walter Kinghorn was one of the brave troopers at the head of the charge. His father Francis received a letter from Major James Lawson, a hotel keeper from Rupanyup prior to the war, describing Walter’s last ride. 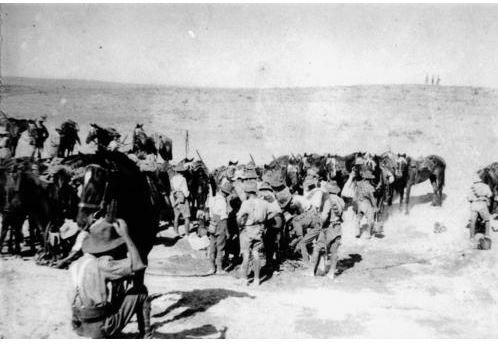 As members of the 4th Light Horse dismounted and fought the Turkish soldiers in the trenches, the 12th Light Horse passed them by and continued on to Beersheba clearing the way for the remaining squadrons to move forward, resulting in the capture of the town. Horses wasted no time drinking from the wells, another advantage of taking Beersheba. 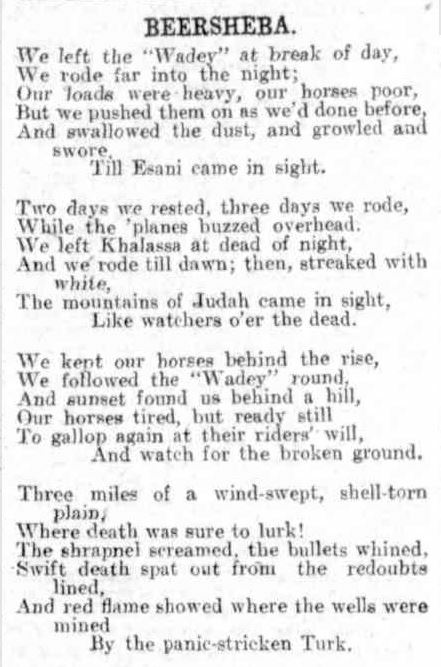 Some horses that had survived the gruelling gallop, dropped dead from exhaustion after drinking. Behind them, on the path they had travelled lay fallen horses, taken down from underneath their riders. Considering the number of troops involved and the risk taken, the casualties were considered light with 31 men killed and 36 wounded. The loss of horses was higher, with 70 killed and at least 70 wounded. Seven other men died at the same trench as Walter from Troopers to Officers, and they were buried close to where they fell. Eight white crosses marked their graves. 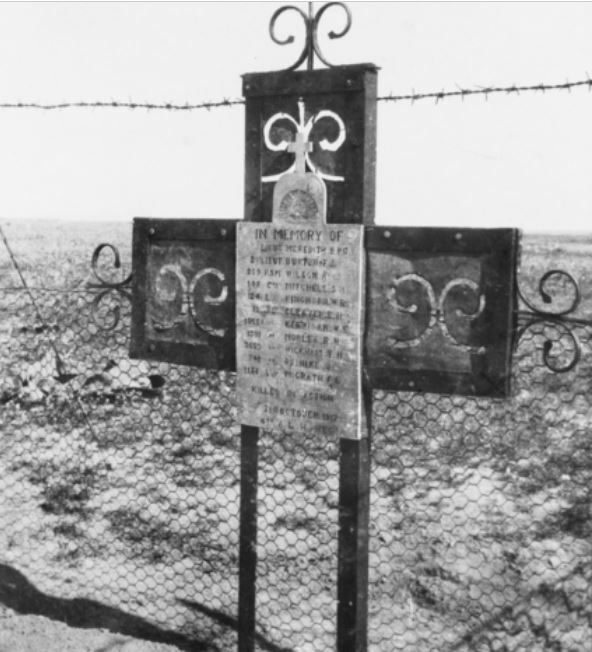 The 4th Light Horse Quarter Master Sergeant James French managed to craft a memorial plaque for the grave site, using scrap metal, the debris of war. 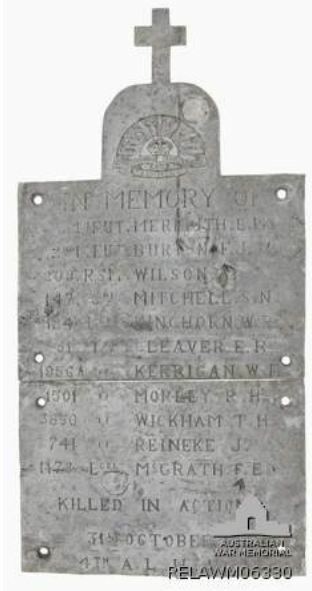 During the 1920s, the plaque was donated to the Australian War Memorial, but not before approval was given by the eight families. He may have been thousands of miles from home when he died, but a touch of Byaduk, family and friends was not far away from Walter. Also in Palestine was the No. 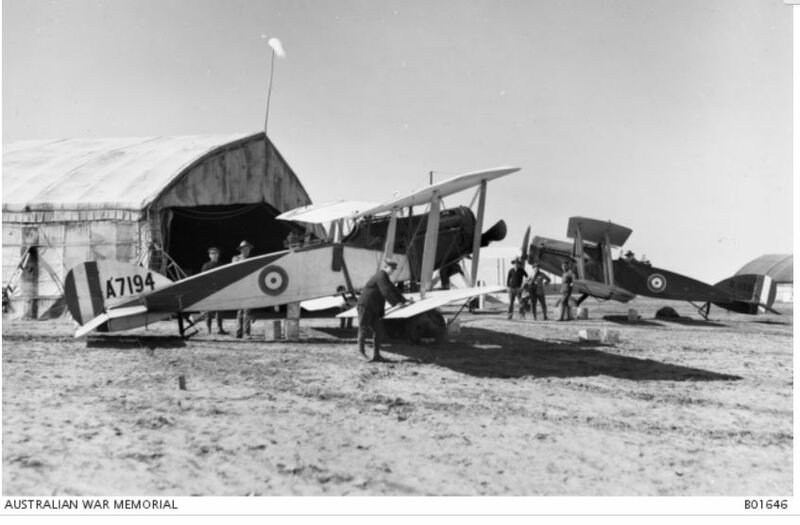 1 Squadron of the Australian Flying Corp (AFC) and among the ranks was Charles Harman, Walter’s brother-in-law. 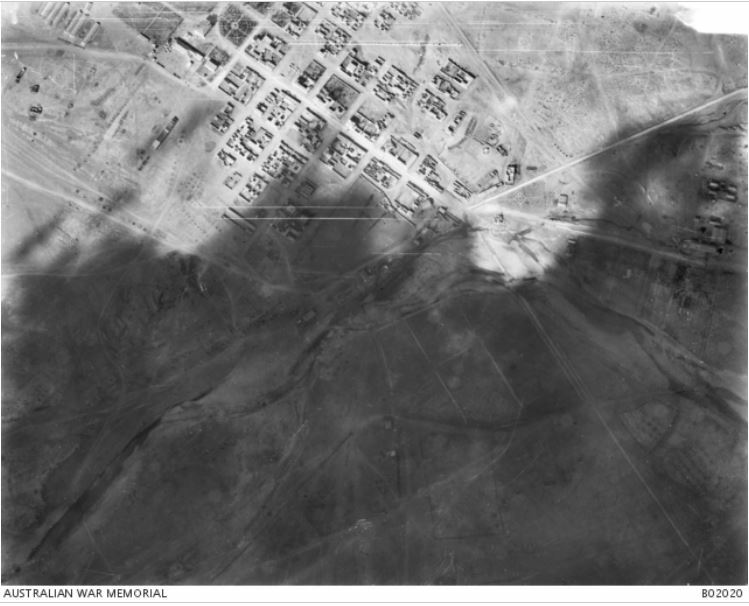 The AFC’s role in Palestine was mainly surveillance, taking photos of the war front and military objectives, such as this photo above Beersheba. Charles Harman, 10 years older than Walter, married Walter’s eldest sister Catherine in 1905, but he would have known Walter all of his life. After all, Charles’s grandfather James Harman and the Kinghorns had neighbouring properties and in 1907, James and Jonathan Harman stood with Frank and Elizabeth Kinghorn for a photograph with other Byaduk pioneers. The two families had known each other for 50 years. Even while they were overseas, letters to Walter and Charles from home would have told them the news of the marriage of Walter’s brother David Kinghorn to Charles’ cousin, Charlotte Harman in 1915. Charles Harman was a Sergeant with the AFC No. 1 Squadron mechanics. The mechanics made a memorial plaque and Charles erected it on Walter’s grave. A touching gesture and most likely one of the most difficult times of Charles’ war service. 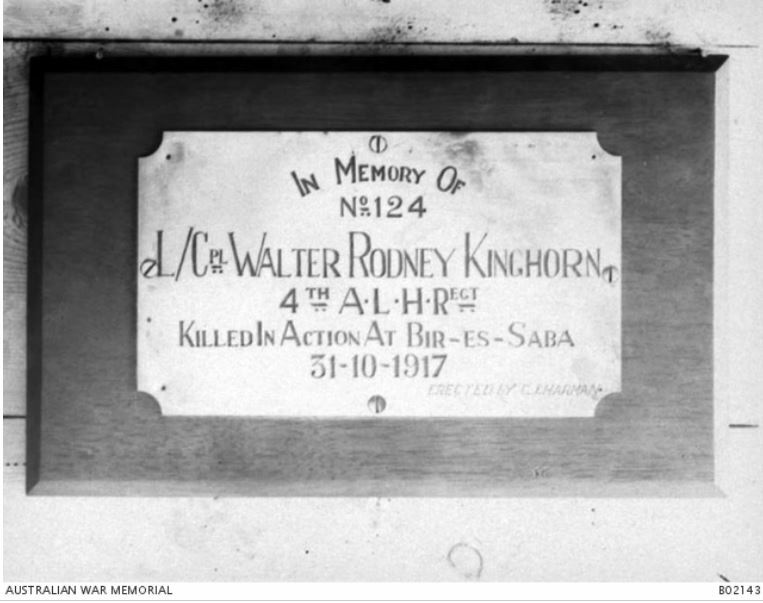 During the 1920s, the plaque was returned to the Kinghorn family after Walter and the other men were exhumed and buried at the Beersheba War Cemetery. WALTER KINGHORN. Photo taken at the 2015 Byaduk Spring Show. The photo of Walter was part of a larger tribute to him. In contrast to the deserts of Palestine, back at home in Western Victoria, the spring grass was abundant, lambs were fattening and the local P&A Agricultural show season was underway. News of Walter’s death, however, began to reverberate from Byaduk by mid-November 1917. His death was felt as far away Trawalla, west of Ballarat, home to Walter’s sister Flora. Reports appeared in both the Ballarat Courier and the Ripponshire Advocate. 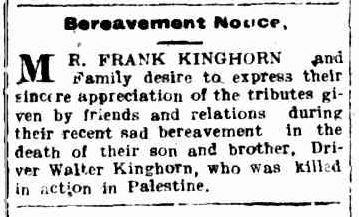 In the Hamilton Spectator, Frank Kinghorn gave thanks to all those who had paid tribute to his youngest son. When Major Lawson corresponded with Frank Kinghorn the following year, he too paid tribute to Walter and reassured Frank that Walter had played a part in the “finest charge in the annals of modern warfare”. Little consolation for Frank, then in his 80s. He died in 1919. Byaduk suffered the loss of 14 men during WW1 and the community moved to remember them. Described as a historic day for Byaduk, on June 28, 1918, the families of the local men that served, planted trees for an Avenue of Honor. Those who had paid the supreme sacrifice carried a laurel wreath on their plaques. One of Walter’s sisters, most likely Fanny, planted his tree. Mrs Hilda Harman, aunt of Charles Harman planted one for him, while Charles’ sisters Julia and Alice planted trees for the other Harman brothers to serve, Reuben Edward and William Louden. A cousin of Charles Harman, Isabella Harman had two brothers-in-law served, Denis and Michael Bunworth. Denis was killed only a month earlier in France. As Isabella’s husband, Jonathan Bunworth planted a tree for his brother Michael, he could never imagine that within two weeks, Micheal’s plaque too would bear the telling laurel wreath. Michael was killed on 1 August 1918 in France. The deaths of the two Bunworth boys was also felt by the Kinghorns as Walter’s brother Frank Jr. married Denis and Michael’s sister, Johanna. Three families intertwined through marriage and united in grief. In 1922, a War Memorial was officially unveiled at Byaduk to remember the fallen. A fitting tribute to the men from Byaduk who served and died. 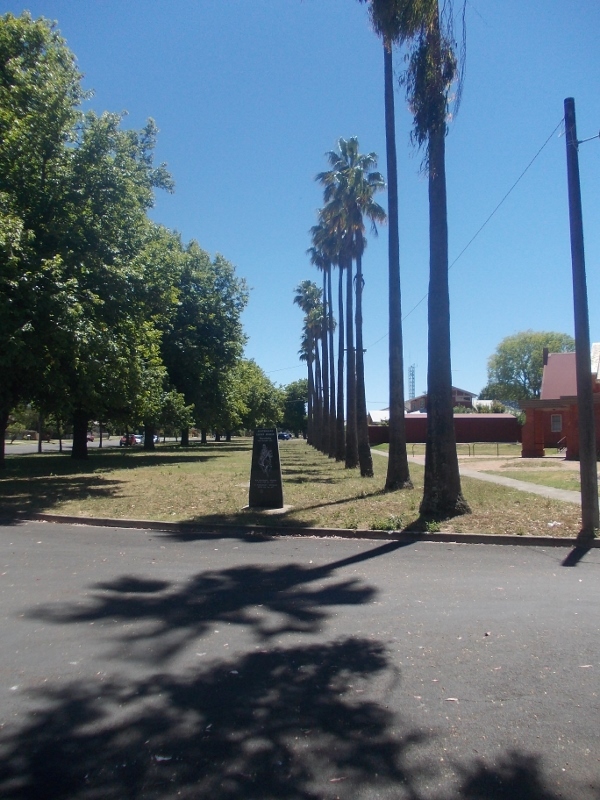 In nearby Hamilton, the brave ride of the Light Horsemen at Beersheba was also remembered, with a row of 14 Aleppo palms planted along Alexandra Parade in 1920 as a tribute. Unveiled in 1995, a memorial stone close to the palms completes the Beersheba memorial. 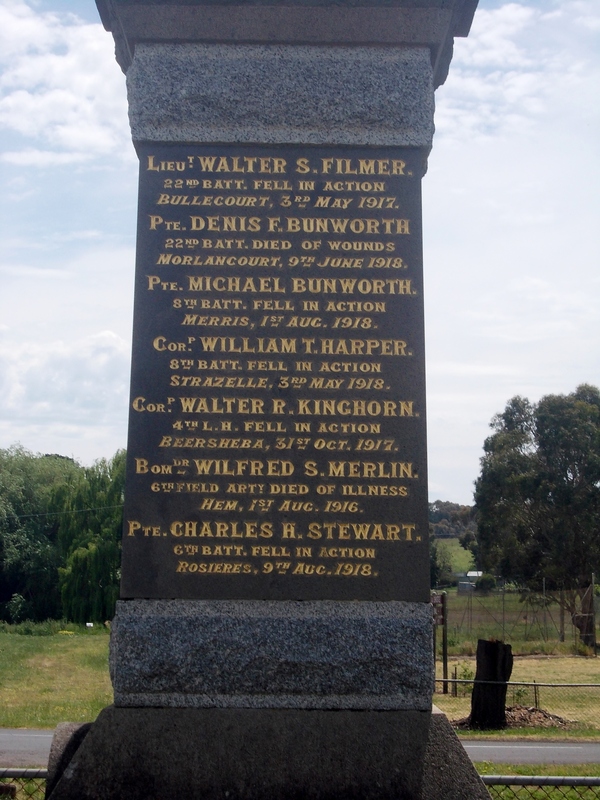 Water Kinghorn’s name is beside Dunkeld boy, Edward Womersley, who died of his wounds in the days after the charge. 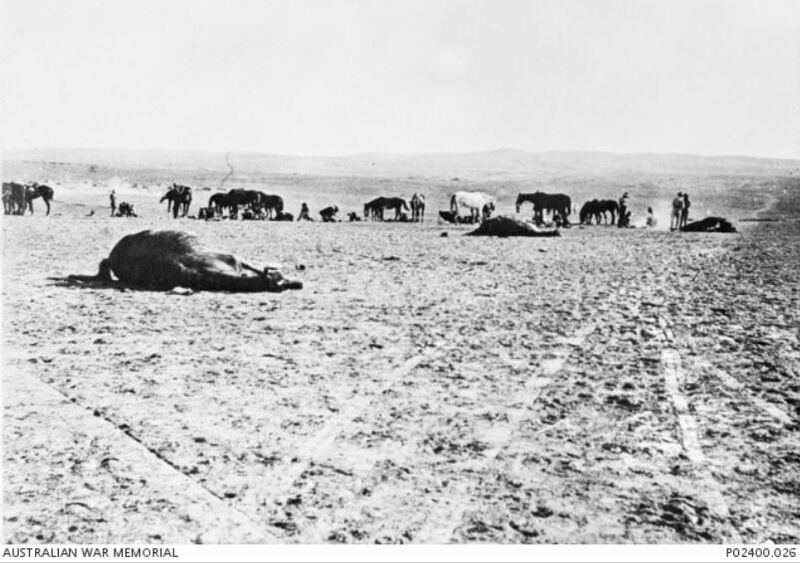 The horses of the Australian Light Horse, especially those from the Western District that never returned to rolling green pastures, but instead only knew sand, dust, flies, heat and death, their bravery and endurance should never be forgotten. 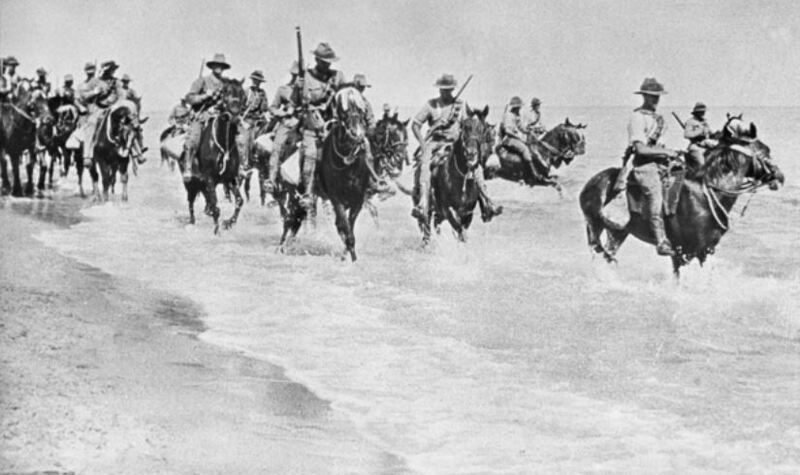 While in no way can the adrenaline, fear and the scale of the charge at Beersheba be recreated, the Australian film “The Lighthorsemen” does go some way to depict the events of 31 October 1917. 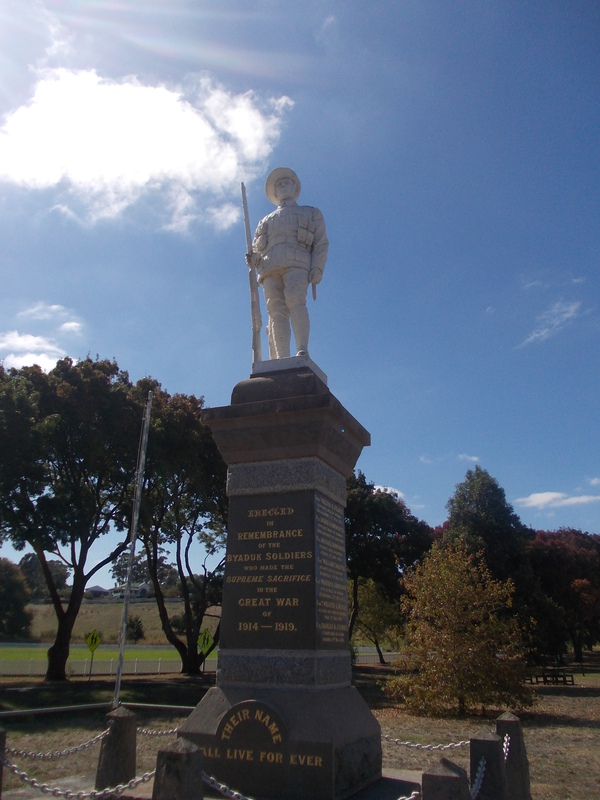 This post was written for the 2014 Trans-Tasman ANZAC Day Blog Challenge. 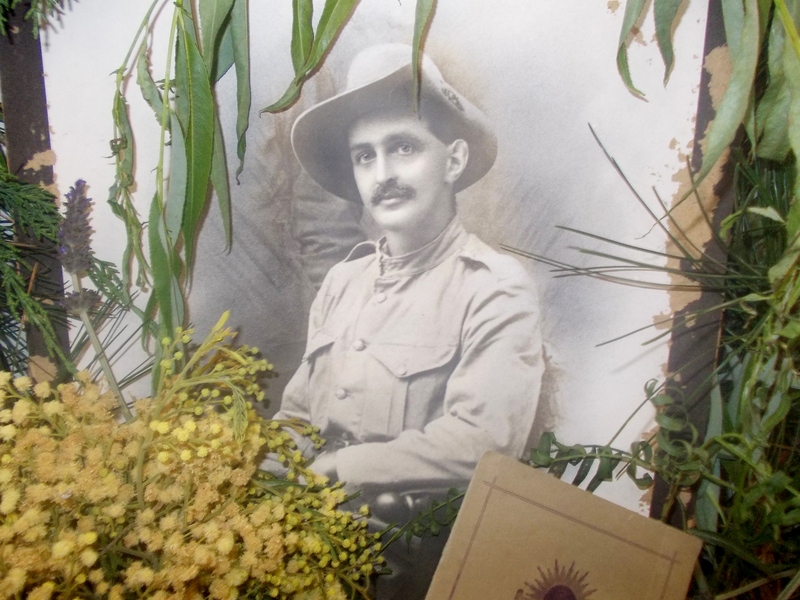 Click on the link to read some great ANZAC day tributes from other bloggers. 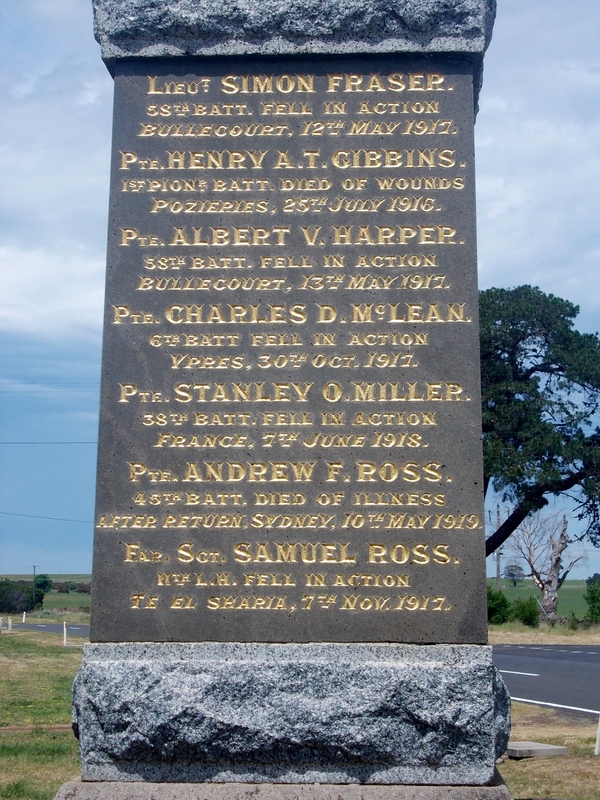 To read my previous ANZAC Day posts, click on this link…Trans-Tasman ANZAC Day Blog Challenge – 2011-2013. 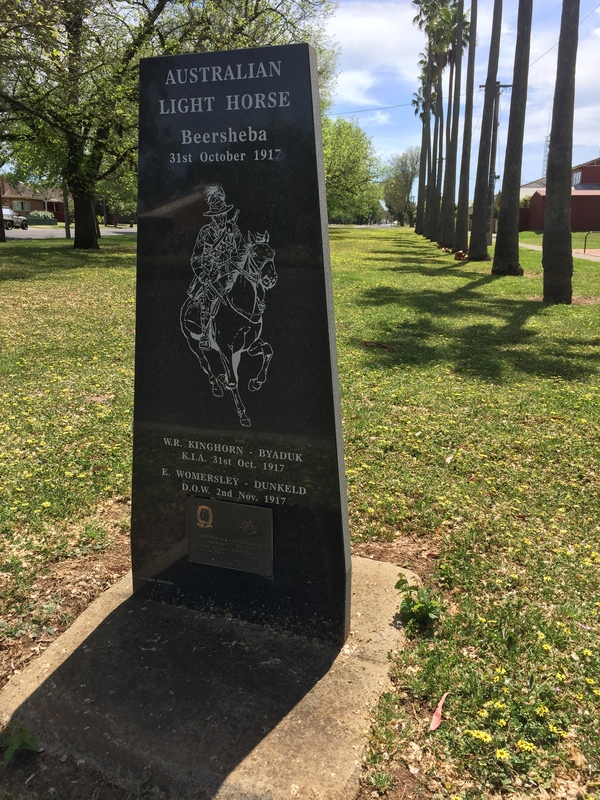 This entry was posted in Anzac Day Blog Challenge, Harman and tagged 4th LHR, Beersheba, Bunworth, Byaduk, Hamilton, Harman, Kinghorn. Bookmark the permalink. A terrific post. Thank you. Yes, what Heather said above, only I just skimmed it so I would not cry for the horses. I wouldn’t even eat Turkish bread, a pox on them all. My Great Uncle Alan Brown born Digby was awarded a Military Medal for his Lighthorse bravery. Thanks Merron for a great report well done. It breaks my heart to read these stories Merron – how well you honoured them! The loss of people is so great and yet I feel for those poor brave horses who had no choice and also did their duty well. Thank you! Well Done Merron. Very well researched, written and presented. What a magnificent post…so much work. Well done you!